We hold immense expertise in catering to the variegated requirements of the customers by bringing forth a remarkable range of Industrial Supplies. 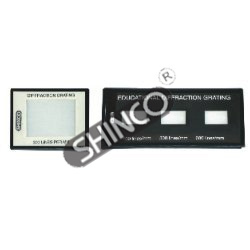 Perfect for class-room demonstration & other application areas, these quality-assured products are widely acknowledged by our valuable customers. These are manufactured as per required norms & standards and are available as per the clients demands and exact specifications laid down by them. Besides, a team of quality experts thoroughly examined on certain well defined parameters of quality. From the day of commencement, we are engaged in catering to the variegated requirements of the customers by bringing forth a comprehensive Diffraction Gratings. The offered range is precisely manufactured by making use of excellent quality raw material and exquisite tools & technology. Lines/mm Cat. No. Lines/mm Cat. No.